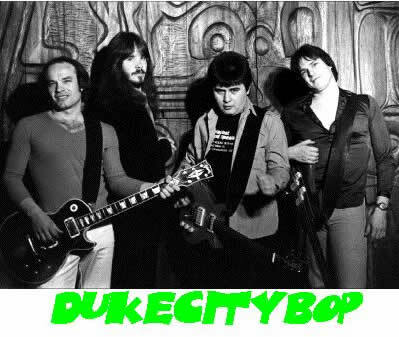 I don't know where you got the dukecitybop photo but it's not the same as the original used for our self titled EP on Riff Raff Records Circa 1980. The photo you have is from the photo shoot we did at the old Sheratan Hotel on Rio Grande. The band existed from 1979 - 1980. Original band members were Greg Chavez on Bass and Lead Vocals and myself Tony Ulibarri on Guitar and Vocals. The two of us were the original founding members of the band. The other original band members were Dave Rasband on Guitar and Vocals and Nick Pickrell on Drums. Back in that era there was a punk band called The L.A. Boppers from Los Angelas and I got the idea to call our band The Duke City Boppers but Greg suggested we call the band dukecitybop (all one word) and I loved the idea so that's how we came up with the name. Back then "The Bop" was a dance I called what was to become known as "The Pogo" where people stand in one place and jump up and down. It was great fun to do with our friends at parties and later our friends and fans did "The Bop" in mass at our gigs which was a something to behold, a mob of sweaty, high, drunk and happy people jumping up and down, sometimes in unison to our loud music. In the photograph shown on your website from left to right are; Dave Rasband, John Kunkel, Tony Ulibarri and Greg Chavez. Unfortunately Greg and John are now diseased. Kunkel was our second drummer, he became our official drummer after Nick awkwardly discovered the rest of us jamming with John at Blakely Pro Audio on Central. Nick became very upset and quit on the spot. I remember feeling very bad for Nick and helping him carry out his drums which happened to be in the studio at the time. At that very moment and by default John Kunkel became the new drummer for dukecitybop. We had a huge following back in those years and became the house band at the infamous Alfalfa's Bar which used to be located on East Lomas Blvd., which was owned and operated by Bill Boes and his wife. During the dukecitybop years we managed to record and release a self titled vinyl EP with four original songs written by Greg Chavez and myself. The songs were; I Just Can't Say Goodbye To You, Lyin', Cryin', Dyin', Long Sleeves and Around We Go. Our peak was winning the Portales Community College "Annual Spring Fling and Battle of the Bands" for two consecutive years soon after opening for Eddie Money at the the Greyhound Arena located between Portales and Clovis N.M. and then the following night at the Pan American Center in Las Cruces. After a miserable Texas tour managed by Bill Boes, Greg, Myself, John and Denver guitar player Bobby Moore, dukecitybop disbanded and split into two bands. One led by myself was to become The Bop and the other was to become Rosie Palmer led by Greg Chavez. Greg briefly used the alias of Butch Mueller for his 6 month run as Rosey Palmer's lead singer before quitting in late 1980 or early 1981 to become a full time firefighter. Original members of Rosie Palmer were Greg, John, Bobby and Dan (last name unknown) on bass who was also from Denver. Original band members of The Bop were Myself, brother Ernie on bass, Dave and Jim Dicouteau on drums. Sorry but I probably don't have Jim's name spelled correctly. Very soon I will be uploading to YouTube about a dozen songs from a concert at the El Rey Theatre in 1992 that we did as a reunion gig. If I remember correctly John Kunkel was living in L.A at the time and died in his sleep the following year from an unknown illness. In the video Greg plays rhythm guitar and sings, I play lead guitar and also sing, my brother Ernie plays bass and the drummer is a friend by the name of Aaron (sorry but I don't know his last name). If you'd like I can give you the links to the video once they are online. As I mentioned Greg passed away two years ago after complications following several strokes. Greg was and is still my best friend and he felt the same way towards me which is why I've decided to release these videos in his honor. That's it for now. I hope this clears up a few things regarding dukecitybop for your website and band history page. Feel free to use any of this information to update your website.